It’s mid-morning on Monday, the day after the Super Bowl and a place on the calendar some still hope to see legislated as a national holiday. There’s a young man in Massapequa who took the morning off. He’s not hung over from a night of partying during a football game. He’s not bloated from consuming wings of various flavors and chips scooped through multiple layers and textures of dips. His body just needed the rest. 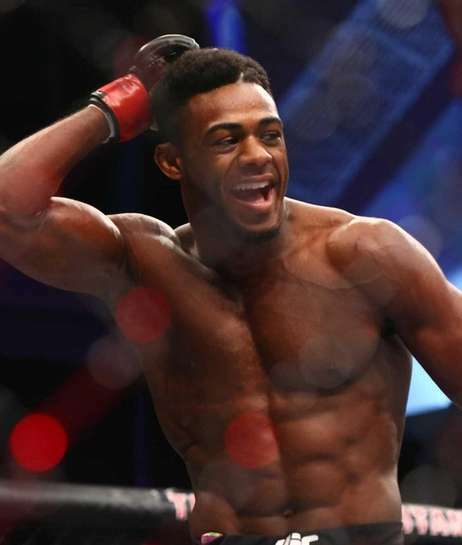 He’s Aljamain Sterling, and he’s a professional mixed martial arts fighter in the UFC. That’s not the typical job for most people, nor is it the typical sport for most professional athletes. It’s a job largely spent in various gyms, pushing the body to its utmost limits through physical tasks. Sometimes those tasks are punching things (or people). Sometimes it’s kicking. Sometimes it involves transforming another human’s body into positions not ordinarily seen in the workplace. And sometimes, it’s all of that at the same time. After eight years and 19 professional fights, Sterling finally understands when to take a day or two off. Sterling sold himself on this concept while watching Serra-Longo teammate Al Iaquinta train for a bout with Diego Sanchez in early 2017. Iaquinta hadn't fought in two years, beset by both serious and nagging injuries. On this morning, though, it’s real-life stuff for Sterling, 29. 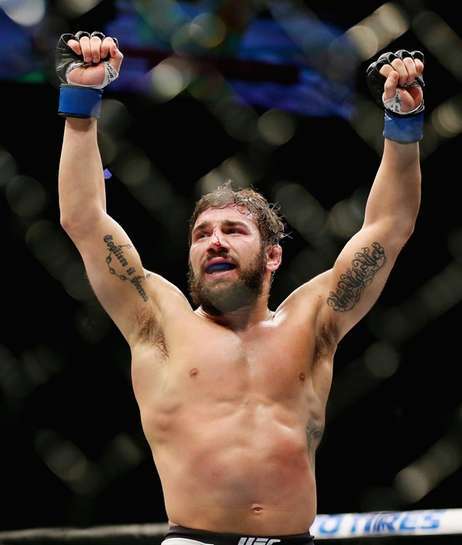 Tidying up the home he bought last summer because he knows he won’t have time the rest of the week before flying across the country to his next fight, a pivotal bantamweight match with Jimmie Rivera of New Jersey, a longtime rival of Sterling’s from the east coast regional MMA circuit. They fight Feb. 17 at UFC Phoenix on ESPN. “About five or six years in the making, been chirping at each other back and forth and it’s finally about to happen," Sterling said. "We’re gonna have to find out who the real CFFC champ is." There’s an oil bill to be paid, a meal to be eaten, a mortgage to be whittled down provided he can remember the password. 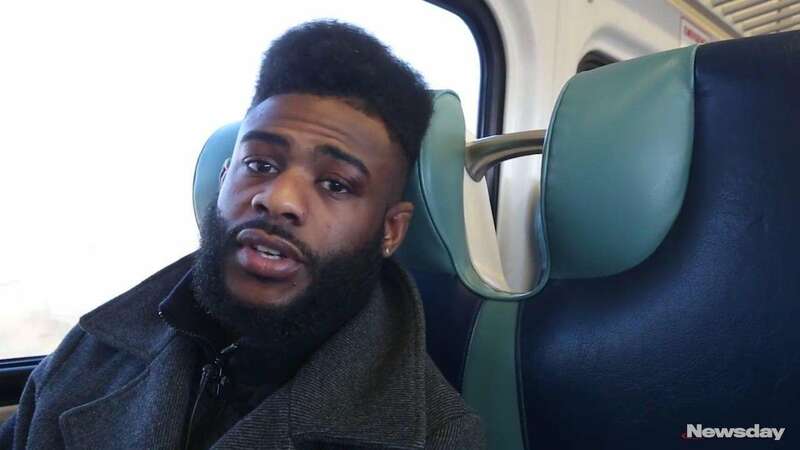 From there, Sterling gets in the car — the one he bought after his second UFC fight in 2014 — and drives to the Freeport train station. Here, he hopes to find a free parking spot in the commuter lot, a rare commodity at Long Island Rail Road stations at this time of day. Sterling is an in-studio guest on the “UFC Unfiltered” podcast, there to promote his bout with Rivera and talk about the sport in general. After conducting an interview on the train, an older woman seated behind Sterling peers her head around the seat. “Are you famous or something?” she asks. “What’s your name?” she asks. He senses her brain trying to process all the syllables in his not-so-common first name. They laugh. She is made aware that she can watch him fight next Sunday, live and free on ESPN. The significance of the bout for both Sterling and Rivera — the seventh- and fifth-ranked bantamweights in the UFC, respectively — was not mentioned. The winner of this bout positions himself quite nicely in the title picture of a division championed by TJ Dillashaw. The conversation ends. Sterling goes back to trying to figure out his password to the pay the mortgage. 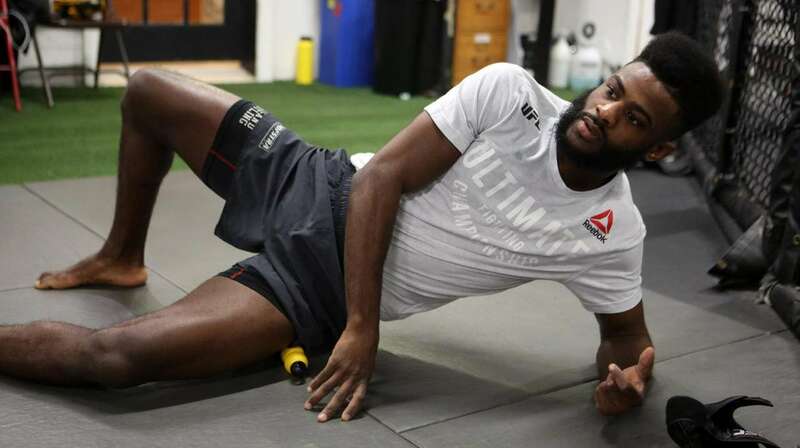 After getting off the train, Sterling is tired and hungry, a combination not unheard of 40-plus days into fight camp and a dozen or so days before he needs to shrink his body to 136 pounds. 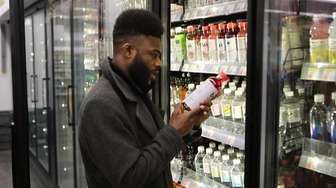 He studies the labels on the drinks in a store inside Penn Station, looking for a healthy beverage with some caffeine. He settles on a Bai, and some gummy bears and fresh-cut pineapple. Lunch may not be too far off for Sterling. Oh, and he figured out his password and paid his mortgage while waiting on line. 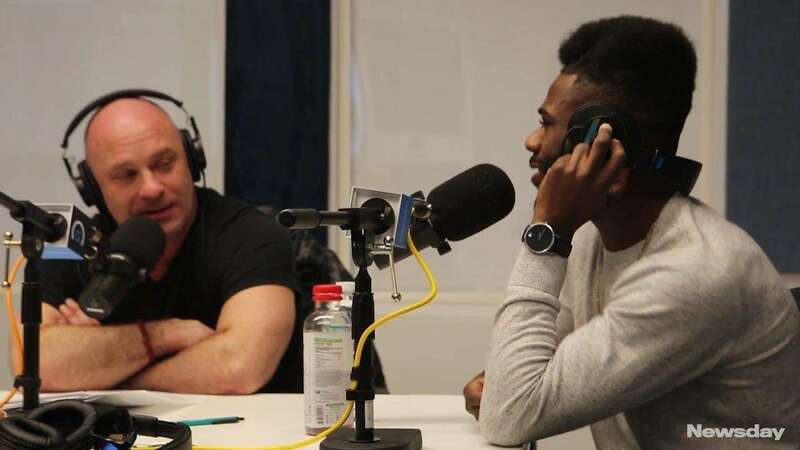 He meets up with Matt Serra, co-host of the UFC's podcast along with Jim Norton. Serra understands the life of a fighter, especially in these final two weeks before a bout. He once was a fighter. He once was a UFC welterweight champion. He also is Sterling’s Jiu-Jitsu coach and one of his cornermen. The two walk to the podcast recording studio and discuss a recent sparring session. The podcast begins. Jokes are made. Fights are analyzed. More jokes are made. More fights are analyzed. Such is the way on the "UFC Unfiltered" podcast, with Serra and Norton racking up solid one-liners amid fight predictions, interviews and anecdotes. On this episode, Sterling's opponent also is scheduled to call in to talk with the hosts. There would be no back-and-forth on the air between Sterling and Rivera. That can be saved for social media now and the upcoming fight week. During an afternoon snack break in the studio's lounge area, Sterling wondered about the difference between the sugars in the pineapple and those in the gummy bears. What makes them different? Why is one good and the other not so much? Is it just one has a better PR team than the other? Sterling pulls out his phone and begins his nutritional research. He scrolls, finds a link, taps it and scrolls more to read. "I'm eating the fruits first, hoping that satisfies the cravings with the sugar," Sterling said. "If it doesn't, I gotta do what I gotta do." Sterling's search for information makes sense seeing how in 2003 at Turtle Hook Middle School in Uniondale, Sterling was named an aspiring scientist. There's a plaque on a shelf in his home, surrounded by high school and college wrestling trophies, to prove it. 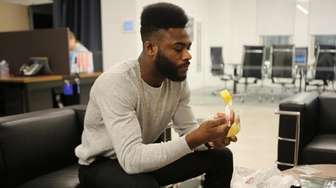 Those pineapple cubes and gummy bears would end up being Sterling's only food between breakfast and a late-night dinner after two training sessions. The Genius Bar at the Apple store at Roosevelt Field delivers Sterling some scary news. The repair on the camera of his iPhone won't be completed until after 5:45 p.m. Sterling's MMA wrestling class will be in full swing by then. He leaves the phone. Several times on the walk from the store to his car, he reached for his pocket. Each time, he came up empty. Once in his car, he reached toward the phone holder attached to his dashboard and wound up with nothing but a dashboard. These are an awkward few minutes for Sterling, a temporarily phoneless millenial who has students to reach, a fight to promote and a post-fight vacation to plan. Once he enters the gym at Longo & Weidman MMA in Garden City, he settles in. This is a comfort zone. This is home. There's no empty grasping for a phone, followed by that actual full-body pause and "Wait? Where is my ...? Oh right!" facial expression. There are only fighters and students now. And, as is customary among the Serra-Longo fighters, good-natured and unending chop-busting. Sterling puts on his headgear and four-ounce gloves and enters the octagon. His job now is to teach the 13 assembled men wrestling techniques and moves for use in MMA fights. 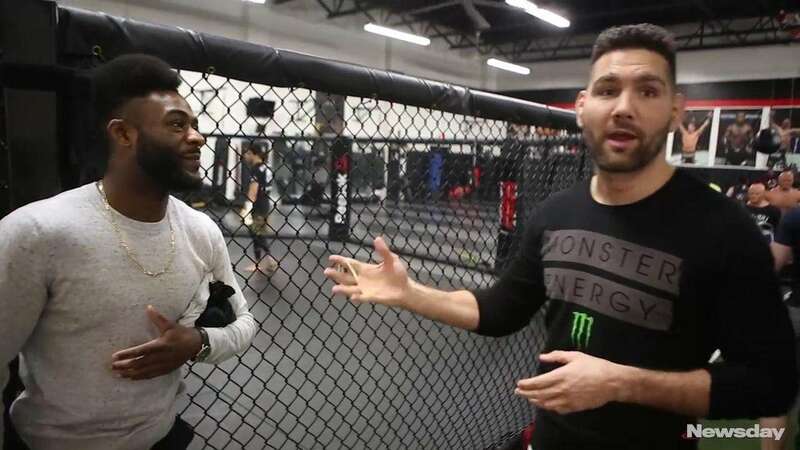 He spends an hour going over different drills with a class that includes fellow UFC bantamweight Merab Dvalishvili, former UFC flyweight Ulka Sasaki, Bellator featherweight John Beneduce and other fighters you may or may not ever hear of beyond the local circuit one day. After demonstrating each drill, Sterling practices each one. He spends the entire hour moving, never once sitting out a drill. As soon as those students leave the cage, another three walk in. They are some of Sterling's wrestlers from Baldwin High School, where he works as a volunteer assistant coach for the wrestling team. He shows the three teenage boys a few "home run moves" to practice ahead of the weekend's Nassau County high school wrestling championship tournament. With MMA wrestling practice over, private lessons completed and Jiu-Jitsu class done, a hungry Sterling has one thing left to do. And not much time to do it. He has to go pick up his phone at the mall before it closes in 15 minutes. But first, a shower. He parks right near the mall entrance, gets out of the car and begins to run toward the door. He has about three minutes. His jacket falls. Out come his wallet, keys and other personal effects. Two minutes remain before the mall doors lock and his phone has a sleepover party with other repaired items. He scoops up his belongings, throws them in the back of his car and runs back toward the mall entrance, his final workout of the day. He returns a short time later with a freshly repaired camera on his phone. He will capture plenty of moments the following week in Phoenix as he prepares to face Rivera on Sunday. Workouts, interviews, trips around the area with his teammates and partners there to help him get through the week. Fight week can wear on fighters, from the workouts to media obligations, from the questioning of self-confidence to the reduced amount of calories and the stress of shedding what in most cases amounts to a double-digit amount of pounds in a single-digit amount of days. Negativity quickly can seep into the brain when it's the night before weigh-ins, the body is slumped over an exercise bike, a small lake of sweat has formed on the floor and that last pound feels like an anvil. A phone with a properly functioning camera will help keep Sterling focused. "When I'm documenting fight week," Sterling said, "I feel like I'm more positive." The day, now a dark and misty night, comes to an end. There's a dinner inside for Sterling to eat, provided he can find the energy. Perhaps a lunch, too. Tomorrow's training awaits, as does Rivera. Prelims on ESPN, 7 p.m. Early prelims on ESPN+, 5:30 p.m.